By using Dr. Yates Hair Science Services, you agree to these conditions. An order placed on the yourhairlossexpert.com website is an offer to Dr. Yates Hair Science Group to buy the product(s) in the order. When you place an order to purchase a product from Yates Hair Science Group through the yourhairlossexpert.com website, we will send you an e-mail confirming receipt of your order and containing the details of your order (the “Order Confirmation E-mail”). The Order Confirmation E-mail is acknowledgement that we have received your order, and confirms acceptance of your offer to buy the product(s) ordered. 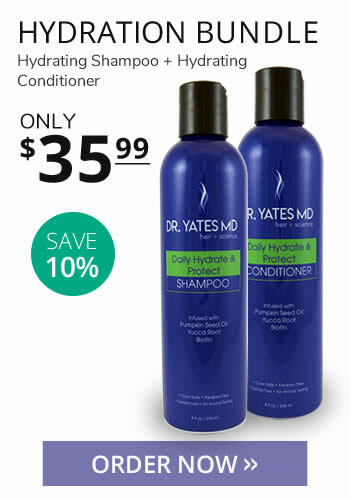 Yates Hair Science Group offers a money-back guarantee on products that are returned complete to Yates Hair Science Group within 30 days from the date of purchase. The return must be postmarked within 30 days of the date of purchase. The refund is for the total cost of the product purchased, plus any applicable sales tax. Customers wishing to claim under the money-back guarantee must first contact Dr. Yates Hair Science Group at 1-866-810-6402 within 30 days of the date of purchase to initiate the return. For more information about Yates Hair Science Group returns policy and to initiate a return request, please contact Customer Service at 1-866-810-6402 or email info@dryateshairscience.com. Shipping charges are determined by the size and weight of the shipment and the destination. Prices do not include freight charges, taxes or duties. If duties are required for an order to be imported, it is the responsibility of the buyer to pay such duties or import fees. For orders placed online, shipping charges are calculated at checkout. We are required to collect sales tax for orders delivered in states where we are located. Appropriate state and local taxes will be added for deliveries in Illinois. All prices are in U.S. Dollars. We accept Visa, MasterCard, American Express, and PayPal. Authorized pre-approved company purchase orders may be invoiced to the company. Physical street addresses must be provided for all orders, as we are unable to ship to PO Boxes. Standard items typically ship within three to five business days. When you use any Yates Hair Science Group Services, or send e-mails to us, you are communicating with us electronically and you consent to receive communications from us electronically. We will communicate with you by e-mail or by posting general notices on the yourhairlossexpert.com website. You agree that all agreements, notices, disclosures and other communications that we provide to you electronically satisfy any legal requirement that such communications be in writing. Subject to your compliance with these Conditions of Use and your payment of any applicable fees, Yates Hair Science Group or its content providers grant you a limited, non-exclusive, non-transferable, non-sub-licensable license to access and make personal and on-commercial use of the Yates Hair Science Group Services. This license does not include any resale or commercial use of any aspect of the Yates Hair Science Group Services, or its contents; any collection and use of any product listings, descriptions, or prices; any derivative use of any Yates Hair Science Group product provide or its contents; any downloading or copying of account information for the benefit of any other merchant, or any use of data mining, robots, or similar data gathering and extraction tools. All rights not expressly granted to you in these Conditions of Use are reserved and retained by Yates Hair Science Group. No part of the yourhairlossexpert.com website may be reproduced, duplicated, copied, or otherwise exploited for any commercial purpose without express written consent of Yates Hair Science Group. You may not frame or utilize framing techniques to enclose any trademark, logo, or other proprietary information (including images, text, page layout, or Yates Hair Science Group name or trademarks without the express written consent of Yates Hair Science Group. You may not misuse the Yates Hair Science Group Services. You may use the Yates Hair Science Group Services only as permitted by law. The licenses granted by Yates Hair Science Group terminate if you do not comply with these Conditions of Use. If you use Yates Hair Science Group Services, you are responsible for maintaining confidentiality of your account and password and for restricting access to your computer or mobile device, and you agree to accept responsibility for all activities that occur under your account or password. Yates Hair Science Group reserves the right to refuse service, terminate accounts, remove or edit content, or cancel orders in its sole discretion. Yates Hair Science Group partners with certain third parties that provide links to the Yates Hair Science Group Services and it does not assume any responsibility or liability for the actions, product, and content of all these and any other third parties. You should carefully review their privacy statements and other conditions of use. THE YATES HAIR SCIENCE GROUP AND ALL INFORMATION, CONTENT, MATERIALS OR PRODUCTS INCLUDED ON OR OTHERWISE MADE AVAILABLE TO YOU THROUGH THE YATES HAIR SCIENCE GROUP SERVICES ARE PROVIDED BY YATES HAIR SCIENCE ON AN “AS IS” AND “AS AVAILABLE” BASIS. UNLESS OTHERWISE SPECIFIED IN WRITING, YATES HAIR SCIENCE GROUP MAKES NO REPRESENTATIONS OR WARRANTIES OF ANY KIND, EXPRESS OR IMPLIED, AS TO THE OPERATION OF THE YATES HAIR SCIENCE GROUP SERVICES, OR THE INFORMATION, CONTENT, MATERIALS OR PRODUCTS INCLUDED ON OR OTHERWISE MADE AVAILABLE TO YOU THROUGH THE YATES HAIR SCIENCE GROUP SERVICES, UNLESS OTHERWISE SPECIFIED IN WRITING. YOU EXPRESSLY AGREE THAT YOUR USE OF THE YATES HAIR SCIENCE GROUP SERVICES IS AT YOUR SOLE RISK. TO THE FULL EXTENT PERMISSIBLE BY APPLICABLE LAW, YATES HAIR SCIENCE GROUP DISCLAIMS ALL WARRANTIES, EXPRESS OR IMPLIED, INCLUDING, BUT NOT LIMITED TO, IMPLIED WARRANTIES OF MERCHANTABILITY AND FITNESS FOR A PARTICULAR PURPOSE, YATES HAIR SCIENCE GROUP DOES NOT WARRANT THAT THE YATES HAIR SCIENCE GROUP SERVICES, INFORMATION OR CONTENT INCLUDED ON OR OTHERWISE MADE AVAILABLE TO YOU THROUGH THE YATES HAIR SCIENCE GROUP SERVICES, YATES HAIR SCIENCE GROUP SERVERS OR SERVERS PROVIDED BY THIRD PARTY COMPANIES FOR YATES HAIR SCIENCE GROUP ELECTRONIC COMMUNICATIONS SENT FROM YATES HAIR SCIENCE GROUP ARE FREE OF VIRUSES OR OTHER HARMFUL COMPONENTS. YATES HAIR SCIENCE GROUP WILL NOT BE LIABLE FOR ANY DAMAGES OF ANY KIND ARISING FROM THE USE OF ANY YATES HAIR SCIENCE GROUP SERVICES, OR FROM ANY INFORMATION, CONTENT, MATERIALS, PRODUCTS OR OTHER SERVICES INCLUDED ON OR OTHERWISE MADE AVAILABLE TO YOU THROUGH THE SODASTREAM SERVICES, INCLUDING, BUT NOT LIMITED TO DIRECT, INDIRECT, INCIDENTAL, PUNITIVE, AND CONSEQUENTIAL DAMAGES, UNLESS OTHERWISE SPECIFIED IN WRITING. (A). Any dispute, controversy or claim arising out of or relating to any Yates Hair Science Group product including, but not limited to, claims of personal injury and/or property damage, shall be submitted to arbitration administered by the American Arbitration Association in accordance to its then existing Consumer Arbitration Rules. The AAA Rules are available online at www.adr.org or by calling the AAA at 800-778-7879. The Federal Arbitration Act (Title 9 of the U.S. Code) shall govern the interpretation, enforcement, and proceedings relating to this arbitration. (B). Arbitration is more informal than a lawsuit in court. It uses a neutral arbitrator instead of a judge or jury, allows for more limited discovery than in court, and is subject to very limited review by courts. Arbitrators can award the same damages and relief that a court can award. By agreeing to arbitration, the parties understand and agree that they are waiving their rights to maintain other available resolution processes, such as a court action or administrative proceeding, to settle their disputes. (C). Any claim shall be brought only in the party’s individual capacity, and shall not in any case be brought by the party as a plaintiff or class member in any purported class or representative proceeding. (D). A party who intends to seek arbitration must first send to the other, by certified mail, a written Notice of Dispute (“Notice”). The Notice to Yates Hair Science Group should be addressed to Yates Hair Science Group set out on http://www.yourhairlossexpert.com/Contact.aspx (“Notice Address”). The Notice must (a) describe the nature and basis of the claim or dispute; and (b) set forth the specific relief sought. If an agreement to resolve the claim is not reached within 30 days after the Notice is received, any party may commence an arbitration proceeding. During the arbitration, the amount of any settlement offer made by a party shall not be disclosed to the arbitrator. (E). There shall be one arbitrator. The arbitrator shall have the power to rule on his or her own jurisdiction, including, but not limited to, any objections with respect to the existence, scope, or validity of the arbitration provision or the arbitrability of any claim or counterclaim. The arbitrator’s award shall be binding on all parties, and judgment upon the award may be entered by any court of competent jurisdiction. By using any Yates Hair Science Group Service you agree that applicable federal law and the laws of the state of Illinois will govern these Conditions of Use other than in relation to a dispute, which will be addressed in accordance with Condition 11 above. Yates Hair Science Group details are found on this link: http://www.yourhairlossexpert.com/Contact.aspx. If you have any questions about Yates Hair Science Group or have questions about Yates Hair Science Group products, please contact Yates Hair Science Group Customer Service at 1-866-810-6402 or by email at info@dryateshairscience.com.